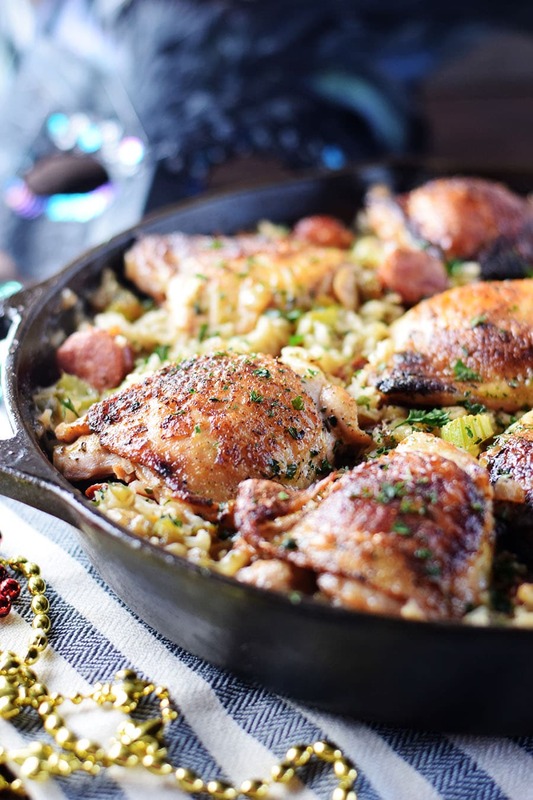 This Louisiana style Chicken and Dirty Rice Skillet will add a little Cajun spice to your week! 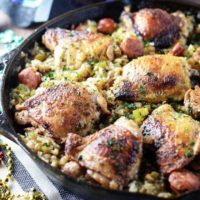 This easy dish promises so much taste on a plate with andouille sausage, the trinity of veggies and with just the right spices and long grain rice all cooked in one skillet! 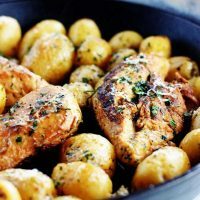 If you are looking for a one pan dish that you can serve from oven to table – look no further! This one gives you a little spice and a lot of flavor your family will love! 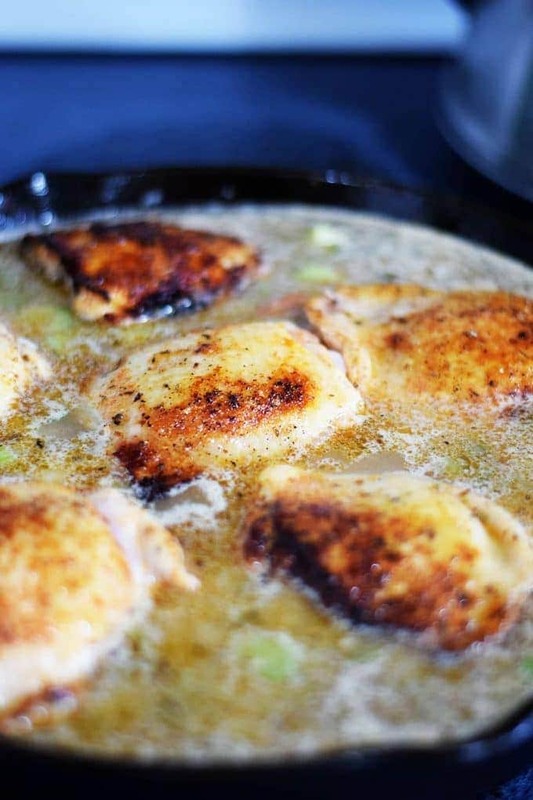 Chicken thighs have such juicy flavors, while the andouille sausage add spice and smokiness to the dish! 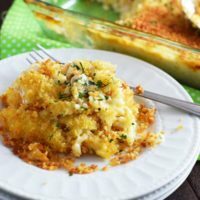 It all just melds into the rice and becomes so flavorful and fluffy while it bakes. 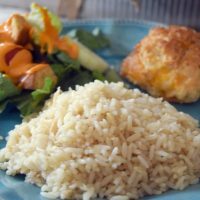 This one is a fun Mardi Gras meal or a great meal to add into your monthly meal planning! Want to add even more spice you can always substitute a jalapeno pepper in place of the bell pepper and tossing in some red pepper flakes or more cayenne pepper. Personally this is just right for my family as is, but I know a few people that want to be on “fire” when eating a Cajun inspired dish. Take the boring out of your weeknight meal and let the good times roll! Here’s how we make it! Combine marinade in a bowl and toss chicken thighs. Let sit for 1/2 hour or while you are making the rest of the dish. In a cast iron skill (or pan that can go in the oven). Over medium-high heat brown sausage. Transfer to a plate a set aside. 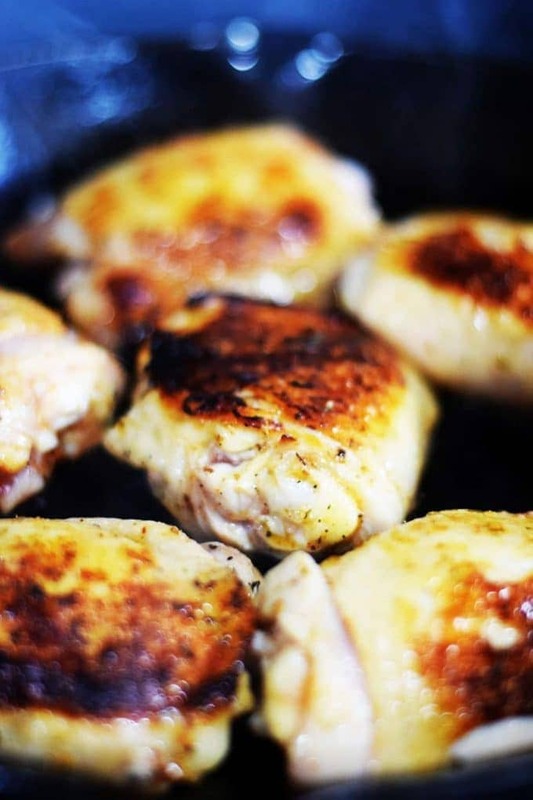 Add chicken thighs, skin side down, and sear for 3 minutes on each side, or until crispy. 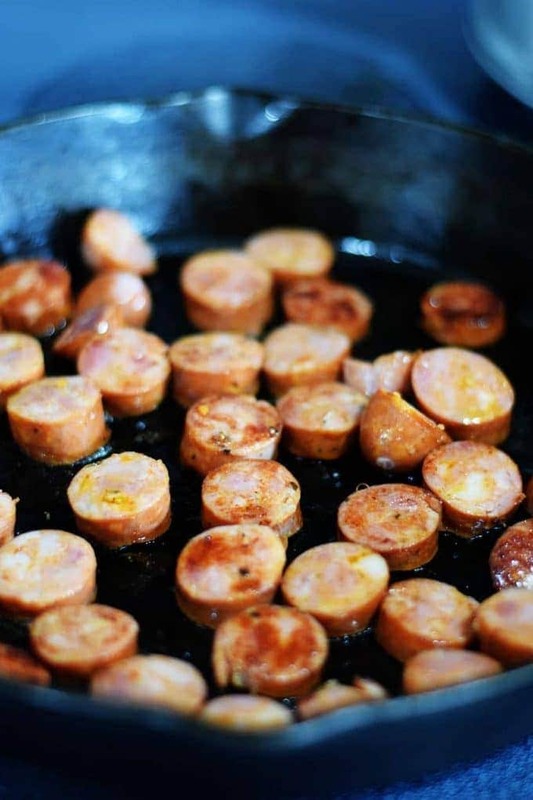 Transfer to the plate with sausage. Remove any burnt bits from pan. Leave drippings in pan, they give a lot of flavor to the dish. If you have to much grease left, remove all but about 2 tablespoons. 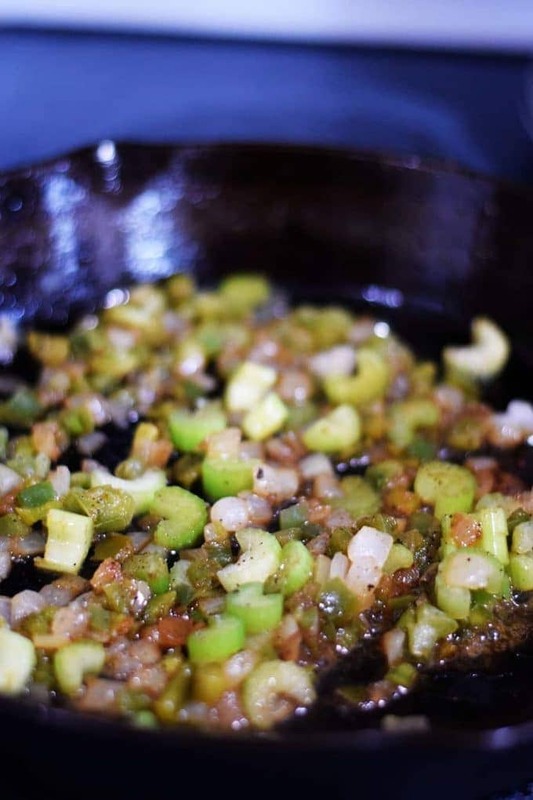 On medium low heat saute chopped onion, celery and bell pepper until softened, approx 2 to 3 minutes. Add in cayenne, salt and pepper and stir. Then add rice and stir. Then add in chicken stock, stir and let simmer for 1 to 2 minutes. 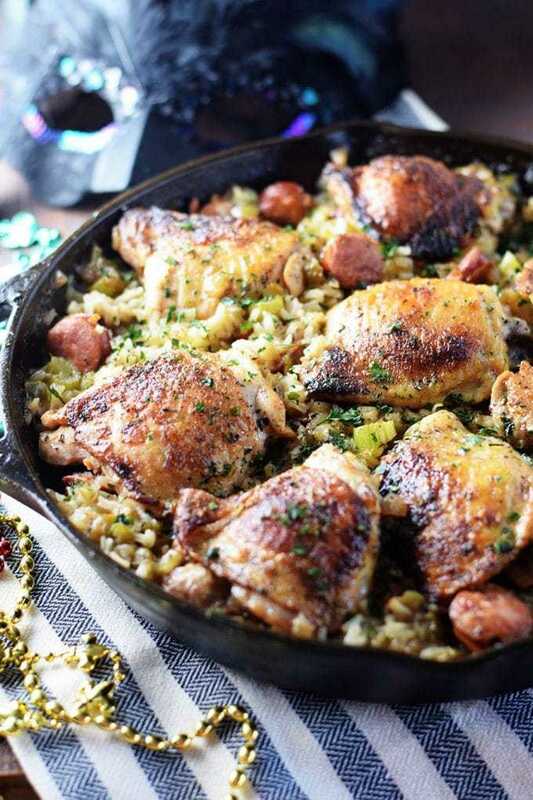 From the plate, add the chicken and sausage and their juices back to the pan on top of rice. Return to a simmer on stove. Then cover. Transfer to oven and bake at 350° for 30 to 40 minutes. 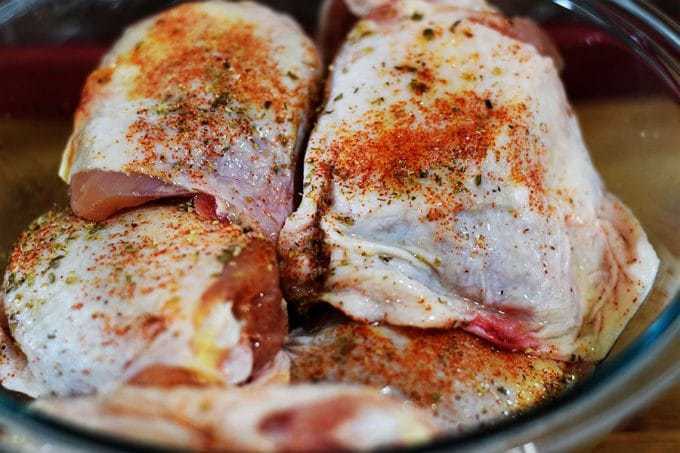 Combine marinade in a bowl and toss chicken thighs. Let sit for 1/2 hours or while you are making the rest of the dish. Remove any burnt bits from pan. Leave drippings in pan, they give a lot of flavor to the dish. If you have too much grease left remove all but about 2 tablespoons. Add in cayenne pepper, salt and pepper and stir. Then add rice and stir. 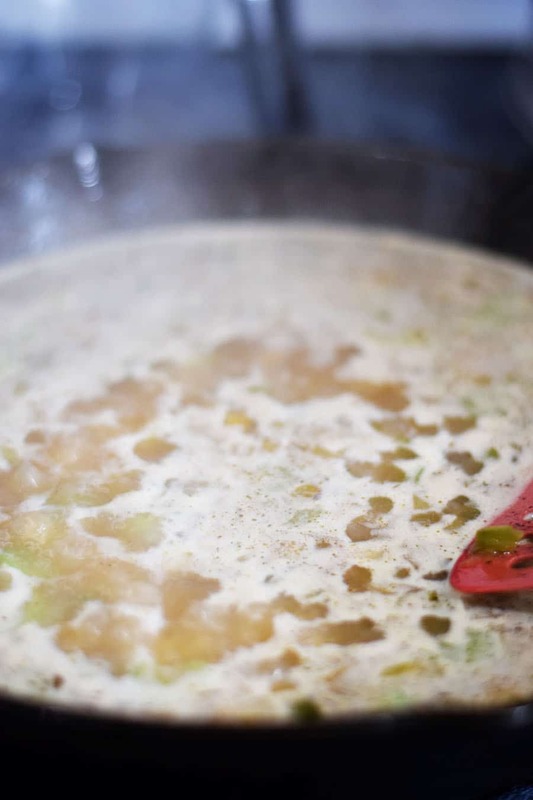 Pour in chicken stock, stir and let simmer for 1 to 2 minutes. From the plate, add the chicken and sausage and their juices back to pan on top of rice. Return to a simmer on stove. Then cover. Remove from oven and garnish with fresh parsley, if desired and serve. Find it over on Meal Plan Monday and Weekend Pot Luck! 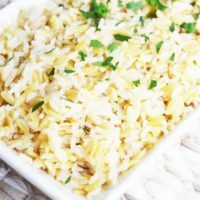 Very good, fast, easy and inexpensive using pantry staples!! Thank you so much, really enjoyed it. This was an awesome dish! Easy a quick. Made today for a nice Sunday dinner. Made enough for leftovers. Thanks for a great receipe! Will be adding to my meal rotation! This looks amazing, perfect for dinner!